The Hotel Chelsea on West 23rd Street. CHELSEA — The controversial renovation of the Hotel Chelsea turned violent Tuesday when residents and demolition workers allegedly got into a violent scrap that spilled out onto the street, police and witnesses said. According to the NYPD, longtime hotel resident Arthur Nash was allegedly pushed and shoved after taking photos of non-unionized contractors working on the landmark building's renovation at about 1 p.m. on Tuesday. The argument continued in the street, where construction workers allegedly assaulted Nash, as well as snatching his girlfriend's camera and smashing it on the ground, police said. Nash said the attack came after he brought two representatives from Construction and General Building Laborer's Union Local 79 to the Chelsea and photographed the construction work. According to Nash, one of the workers recognized union member Gerry Kraft, and shouted at them to leave. Part of the scuffle was filmed by Nash's girlfriend, who he did not wish to identify due to fears of retaliation. "They swung first," Nash said. "All I was doing was taking pictures. The union guys didn't swing at all." The brawl spilled outside, Nash claimed, after he tried to leave the hotel and construction workers were waiting for him. As he tried to make his way towards Seventh Avenue, Nash said he was attacked again by at least a dozen workers. A seperate video, provided to DNAinfo by Nash, shows several men in hardhats chasing him down the street, and a man snatching a camera from his girlfriend. 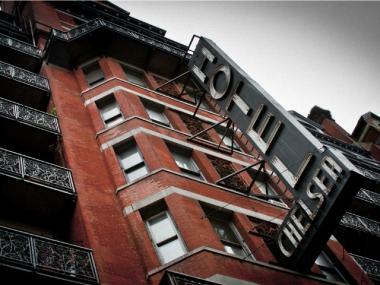 The Hotel Chelsea, at 222 W. 23rd St., was bought by developer Joseph Chetrit over the summer and soon stopped accepting guests. Around permanent 80 residents remain as construction goes on around them. Many tenants claim the renovations have been loud, destructive and disruptive. A recent health report found that the renovations were spreading dangerous amounts of dust, lead and other contaminants into the air. On Dec. 2, a tenant's organization filed a lawsuit against the Chetrits, claiming the renovations have been harmful to residents' health. That's created a tense relationship between workers and the remaining residents. After the initial violence, Nash said he tried to leave the hotel but was followed by about a dozen men. "A whole mass of workers chased him down the sidewalk," said Ed Hamilton, a 16-year Hotel Chelsea resident, who witnessed that assault outside of the building and later tried to intervene. "They started trying to punch him and attack his girlfriend, too, so I got into it," added Hamilton, who's chronicled the hotel's saga through the years on his Living with Legends blog. Hamilton said he was punched in the head and knocked to the ground, and that workers took Nash's girlfriend's camera and smashed it on the sidewalk. Nash said he was punched roughly seven times before one of the union representatives, Kraft, called the police and the contractors fled back to the workers' entrance to the hotel. Nash was taken to Beth Israel Hospital and treated for minor injuries. Hamilton went to the hospital later, and was treated for minor bruises. The hotel's attorney, Michael Brown, said he was aware of an incident involving police, but could not discuss the details of it. Calls to Armagh Contracting, the Bronx-based firm working on some of the renovations, were not returned. Police confirmed that a criminal complaint had been filed with the 10th Precinct, and that the incident is under investigation. No arrests have been made in the case. Nash, who said he is pressing charges, plans to continue to live in the hotel for the time being. "It's my home. That's the point we were trying to make to these individuals who say we have no right to be here," he said. "I absolutely don't feel safe in the hotel. These people are maniacs and animals."